Today, Donald Trump announced his intention to revoke “birthright citizenship,” the Constitutional guarantee anyone born in the United States is automatically a citizen of the United States. Trump, naturally, accompanied his announcement with a bunch of nonsense about how we’re the “only” country that grants citizenship by right to all babies (we very much aren’t) and suggested there was something ludicrous and unfair about people crossing our borders, plopping out their newborns on our soil, and then having those tiny foreigners lay claim to our land. 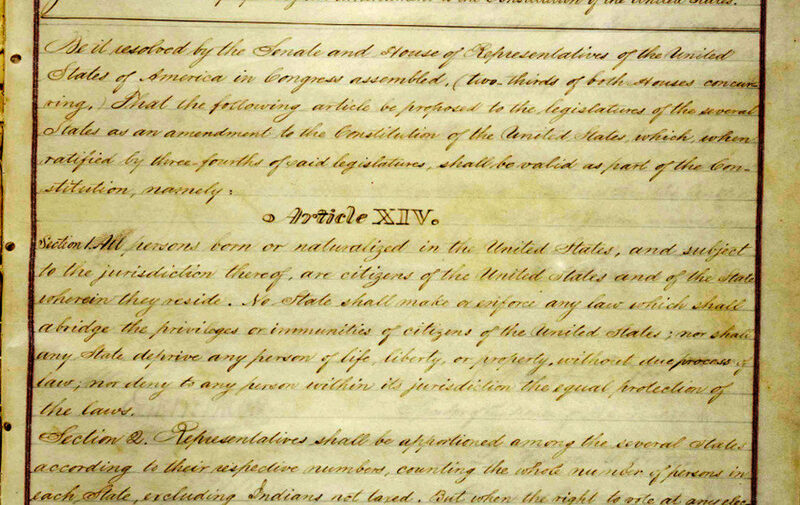 To accomplish the idea he floated on Tuesday, Mr. Trump would have to find a way around the 14th Amendment to the Constitution, which states, “All persons born or naturalized in the United States, and subject to the jurisdiction thereof, are citizens of the United States and of the State wherein they reside.” The amendment means that any child born in the United States is considered a citizen. Amendments to the Constitution cannot be overridden by presidential action, and can be changed or undone only by overwhelming majorities in Congress or the states, with a two-thirds vote of both houses of Congress or through a constitutional convention called for by two-thirds of state legislatures. However, I think my left-wing friends ought to be cautious here. We can scoff and wave away Trump’s proposal by saying that he “can’t” do that. But we would do well to remember: The scope of what a president can and can’t do is not actually determined by the text of the Constitution. It is determined by the judicial branch’s interpretation of the Constitution. And what the courts decide depends as much on who is on the court as what the laws themselves say. When Brett Kavanaugh was first nominated to the Supreme Court, I criticized those (like Akhil Amar) who accepted Kavanaugh’s insistence that he was a fair and neutral judge who did not bring his conservative politics into his decision-making. 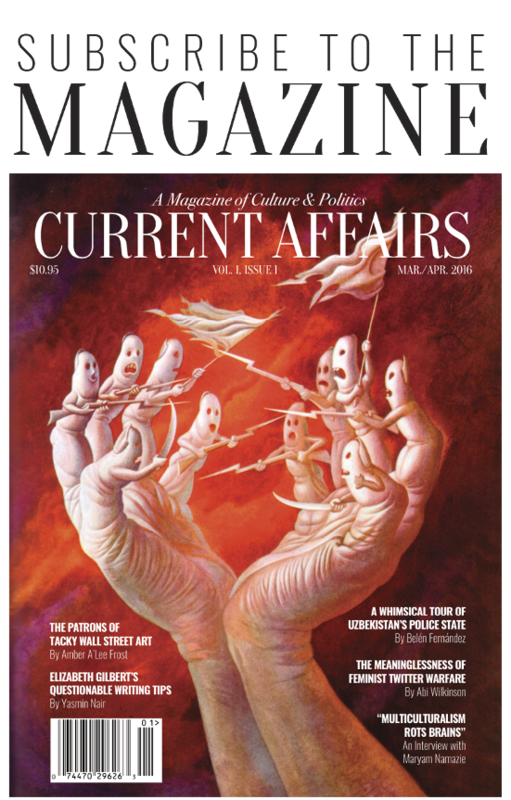 Statutory text, and the Constitution itself, are frequently ambiguous, and how judges interpret them depends a lot on what their normative values are—in other words, their politics. There are some instances in which the law is simple, or the interpretive issues at hand do not really have “left/right” implications. But there are plenty of others (e.g., Was an employer acting in good faith? What constitutes a reasonable search? To what degree does the 1st Amendment protect corporations?) where politics are inescapable, which is why we talk about “liberal” and “conservative” justices. Frequently, then, it’s not enough to declare that “the law says X.” We also have to ask “But who will decide what the law says?” And if the answer is “a bunch of rich conservative men,” then in practice a law might turn out to say something quite different than what it seems to say. The Constitution is not self-enforcing: It does not swoop down from its perch and say “Hey now, Mr. President, you can’t do that.” It only offers protections so long as courts agree to uphold them, which means that “who holds power in the courts” is incredibly relevant to the question of “what the law protects.” Just look at the entire history of law: Japanese internment was plainly unconstitutional (Due process!). It didn’t matter, because the Court upheld it. Dred Scott was a horrendous legal opinion. But it was the law of the land, because of who was on the Court. Unfortunately, with Brett Kavanaugh having been confirmed to the Supreme Court, today’s last word on the Constitution will be had by five unelected right-wingers. Okay, but the 14th Amendment is crystal clear, right? “All persons born or naturalized in the United States… are citizens of the United States and of the State wherein they reside.” How could any justice, no matter how right-wing, possibly get around that? Well, the right has a longstanding theory of exactly how to get around it. Let’s look at what that ellipsis leaves out: “naturalized in the United States, and subject to the jurisdiction thereof, are citizens.” You can guess what their next move is: Arguing that the U.S.-born children of non-citizens aren’t “subject to the jurisdiction of the United States.” That might seem equally crazy: After all, if those children break any of our laws, they’re going to go through the exact same legal process as anyone else, and jurisdiction refers to the extent of a power to make legal judgments. One reason the Democratic Party fails so dismally in politics is that many people seem to care more about being right than taking power. They believe you can fact-check your way to victory: If you prove the other side wrong, you win. This is not how politics works. It doesn’t matter whether the other side’s arguments are a big pile of irrational, fallacious manure. What matters is whether they have the power to reshape the world in accordance with their vision. I am not sure whether the conservative Supreme Court would go along with the Michael Anton interpretation of the 14th Amendment. John Roberts, who cares a lot about the Court’s legitimacy, seems like he’d be hard to sway on that. But I have no doubt that if Trump and his legal advisers believe in a fringe legal theory, Clarence Thomas, Brett Kavanaugh, Sam Alito, and Neil Gorsuch are more than capable of believing in it. And that’s already four justices out of the necessary five! If the Court lost Stephen Breyer or Ruth Bader Ginsburg, and Trump stuck on another right-wing justice, so much for the “true” legal interpretation! The Constitution cannot protect your rights if the appointed guardians of the Constitution all agree with the guy who is stripping away your rights. Now, I do think that the birthright citizenship thing may be a stunt that won’t go anywhere. And I agree with those who say it’s a trap: Trump is trying to get us to debate the idea in order to legitimize it. Even if he can’t actually do it, by introducing the notion, he makes it more viable in people’s minds, thereby increasing the chances that it will someday happen. By entering into an argument about it, we give Trump exactly what he wants. Perhaps best just to dismiss him. But I would also warn my friends: Do not think that the Constitution will protect us. In Faherenheit 11/9, Michael Moore shows a Jewish newspaper from the 1930s which reassured people that Hitler would be constrained by the glorious and robust German Constitution, which meant that he couldn’t do the things he said was going to do. Constitutions are very important documents. Their words do not mean anything, though, if there is nobody in charge who is willing to uphold them. You can scream “but this is illegal!” through the bars of your cell, but it won’t make a difference. (Ask the Guantanamo detainees.) Laws exist in their enforcement, and without an apparatus to uphold them they are just pieces of paper. It doesn’t matter whether we say that Trump is violating the law. We also have to make sure that he doesn’t have the power to get away with it. * We used to sell a “Know Your Rights” poster that suggested people’s rights didn’t mean as much as they thought they meant. 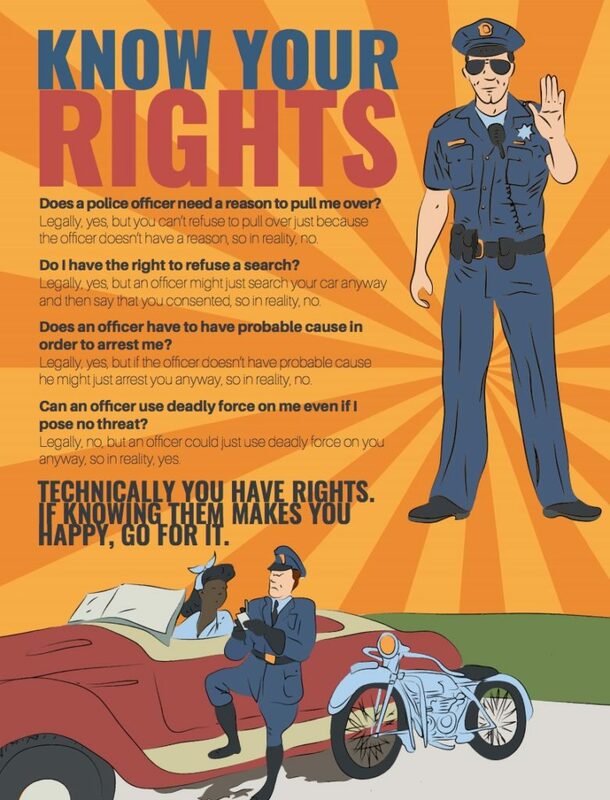 It was a parody of traditional Know Your Rights posters, and said things like “Does an officer have the right to search my car without my permission or reasonable suspicion? No, but the officer can just search your car anyway and say that you consented and there’s nothing you can do about it.” Some of my friends strongly disliked this poster, because they thought it was overly cynical and suggested people shouldn’t bother to learn their legal rights. After all, if your rights can just be violated, what’s the point? Shouldn’t you just resign yourself to being crushed by the state? Are legal battles meaningless?